Given that skiing and snowboarding’s most basic goal is to avoid falling, balance is obviously important. The off-season can be a good time to work on balance skills either at the gym or at home. Related to balance, proprioception is the technical term for the sense of knowing where your body parts are in space and relative to each other. When performing the complex movements involved in skiing or snowboarding, good balance and proprioception are key. For skiers, the SkiA Ski Trainer ($70) directly addresses these abilities. The product also gives skiers an excuse to actually put on their ski boots in the middle of the summer. The SkiA Trainer has straps that hold different-sized blocks on the ski-boot soles. The smaller blocks are more challenging. The basic idea is to simulate skiing movements while balancing on the blocks. While not ski-specific, slacklines are also popular and effective for off-season balance training. Lindsey Vonn, for one, loves to test herself on the slightly springy webbing that measures an inch-or-two wide. Eirik Hole, the strength and conditioning coach for the women’s U.S. Ski Team, incorporates balance work as part of his regimen for the world-class ski racers. He says recreational skiers and snowboarders can begin with simple exercises that do not require any equipment. Certified personal trainer Lynette Talbott teaches a ski-conditioning class each fall at the Tahoe Center for Health and Sports Performance in Truckee, California. For balance, she starts students with simple single-leg balancing and then single-leg balancing on an unstable surface. For a cost-free option at home, a sofa cushion can serve as an unstable surface. According to Talbott, simultaneous strength and balance training is falling out of favor in light of exercise research studies. 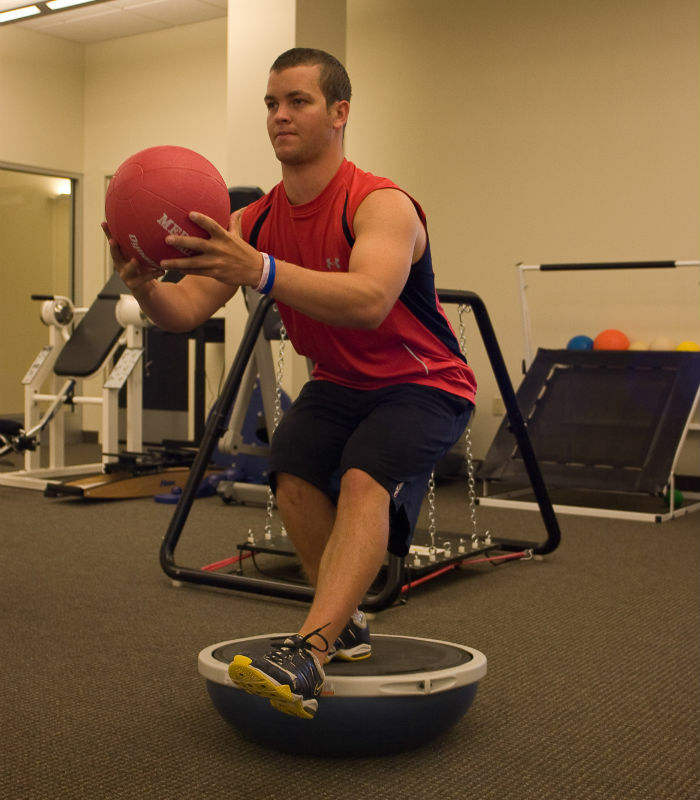 An example would be doing overhead dumbbell presses while standing on a BOSU ball (those half-balls found at most gyms). While both are good activities, they don’t need to be done at the same time. In fact, Hole uses BOSU balls with his U.S. Ski Team athletes for balance-specific exercises. The skiers jump forward and from each side on and off the balls. He also has them use balance boards and trampolines during dry-land training. A little balance training can be a productive way to spend a little time in the summer. The weather may be warm now, but a little effort could pay off when the snow falls. Get a Ski Edger. Buy Mine. It helped me immensely to learn the lateral move and leg extension, with the upper body always facing down-the-hill (& quiet). Well worth the co$t for what it taught me.